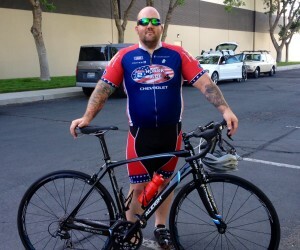 My Name is Corey Blatchford, and I am a Medically Retired Veteran. I served close to a seven years in the US Army as a 12B Combat Engineer. I entered the Army in 2004 to support and defend my country. I was deployed to Iraq in 2006-2007 for 15 months, and on my last month there I was hit by an IED that damaged my left shoulder and left me with Mild Traumatic Brain Injury. Since then I have undergone 4 surgeries and endless amounts of therapy. When I was retired from the army I felt a lot of loss and pain both physically and mentally. Coming home I felt really alone and thought that I would never be able to find an outlet for my pain. To help with my injuries and PTSD I found a program called Ride2Recovery. Bike riding helps with my weight and also helps with my mental health. When I am riding I am able to be calm and enjoy life. I recently was donated a new bicycle and needed a FIT. Julie Young of o2Fitness/Silver Sage Sports and Fitness Lab located here in Reno heard about my new bike and sponsored aPro Fit to ensure over-use injury prevention, and maximize my comfort and power output. From the moment I stepped into her office I felt calm and relaxed. She was very attentive to my concerns and what it would take to lessen the pain of my injuries while riding. Thanks to Julie I have now added more miles and faster ride times without being in pain that I would have had I not had the Fit done. Thank you for everything and thank you for your continued support in the Ride2Recovery Program. Brad Rassler – Now where were we? Oh, right. On Mt. Tam with Bruce Dern and me at home, nursing a crapped-out Achilles. Since that post well over a month ago, I’ve driven some 2,888 miles to the Green Mountains of Vermont. I consumed seven donuts on the Trans-Canada Highway. I occupied my office at the headquarters of Alpinist and Backcountry Magazines, where I’m spending the summer, scribbling for a non-living. The first three weeks on the gig I worked well over 200 hours and consumed more donuts and maple syrup. No shortage of Dunkin’ joints around here, dontcha know. Back to the Great Basin…Prior to lighting out from Reno, Julie gave my bike a good going over; rather, she fit me to it…using a groaniometer (nah – it’s really called a goniometer). Anyway, I’m sitting on my bike properly, and for the first time ever, I inhabit it rather than it having me. During the same session, Julie asked me to execute a series of one-legged squats. When my knees tracked inward, she diagnosed weak hips and emphasized the importance of performing the floor exercises she had prescribed early on. She analyzed my running gait using video and Dartfish. She re-emphasized the criticality of hip activation exercises. the pull-tab of my new Brooks Pure Grits (no Achilles notch on that model). When I begged for relief, Andy Pasternak sent me to physical therapist who informed me I had weak hips (Julie: 1, Brad: 0). This kindly soul – the PT — forbad me to run, hike and climb. So I scrapped a planned foray into the Sierra’s Palisades and attended her torture sessions instead. s and glutes. She plied the Achilles with ice and stuck electrical patches to my ankle, cranked the knob and redlined the stimulation meter; I watched in fascination and delight as my toes twitched like a machine-gunned mobster doing the frug before hitting the ground for good. The following week, I lit out for Vermont. So here am I. 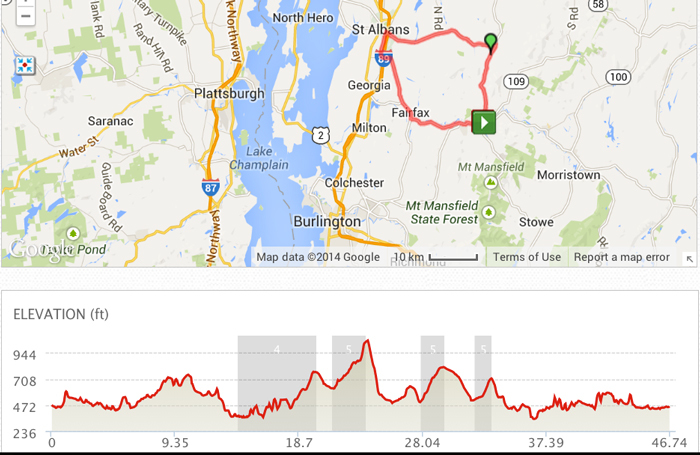 Turns out I landed in the midst of some of the best road riding in New England. Smuggler’s Notch is just up the road, and on the other side of it, Stowe and a 20% climb to regain the notch. Rain falls nearly every day, which puts the “green” in the Green Mountains. There are a lot of happy cows around here. The locals are mighty friendly in that reserved, New Engandy kind of way. More soon. Meanwhile, here’s a pic of one of the scenics just outside of Alpinist’s headquarters. It might look flat, but it isn’t; all terrain’s a false flat around here. 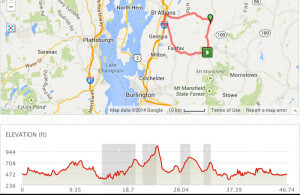 http://silversagecenter.com/wp-content/uploads/2014/06/Cardiac-Ride-Albans-Loop1.jpg 455 700 digitalnordic http://silversagecenter.com/wp-content/uploads/2014/06/SS_14171-Logo-Development-SportsLab-Horz-header-300x83.png digitalnordic2014-06-30 07:09:332015-01-21 07:23:46Brad Rassler – Now where were we?